About the Book: Bridge survived an accident and as she left the hospital she was told she must have survived for a reason. Emily is embracing a new found popularity with boys at school and a crush on an older boy. And Tabitha is the friend who tells people like it is. Sherm is writing letters to his grandfather-but not sending them. And an unnamed narrator wanders the neighborhood on Valentines Day wondering about what makes a true friend. This cast of characters will connect and their lives will entwine and they'll figure out middle school together. GreenBeanTeenQueen Says: Librarian confession-sometimes I feel like I'm the only non Rebecca Stead fangirl. I mean, I liked Liar and Spy well enough and I When You Reached Me was ok, but I felt like the only person who didn't gush over it. Yet there's something about her writing-and the mad devotion from librarians all over-that keeps me reading. I was actually very intrigued by this book because it's older middle grade/younger YA and I had a feeling that in Miss Stead's hands, that would be something magical. Then I read this quote that my friend Angie posted and raved about and I was hooked-I had to read Goodbye Stranger. "That's what life is. Life is where you sleep and what you see when you wake up in the morning, and who you tell about your weird dream, and what you eat for breakfast and who you eat it with. Life isn't something that happens to you. It's something you make yourself, all the time." Told throughout the course of several months (with one character's narration taking place all in one day), the novel takes interwoven storylines from a group of friends, and those that surround them, through their struggles with middle school. Seventh grade is a rough year. It's a time when friendships can change, relationships can blossom, and life can feel like it's turning upside down. And middle school is a time when life feels as though life is in a constant state of confusion. Growing up is hard and Rebecca Stead captures the awkwardness, confusion, and growing pains perfectly. As an adult, reading this book was like stepping back in time and remembering what it was like to be 13 again. As a young teen, I think readers will relate with the characters very strongly and with such a wide cast, I think they'll find someone they can identify with. Bridge is struggling with trying to figure out who she is-she's been away from school and while her best friends are there, they seem to be changing around her and she's changing too, but she's not sure what that means. She's also becoming friends with Sherm which makes her wonder how can you be friends with a boy and what does that mean? Bridge is also struggling because she's taken the words of the nurse that she survived her accident for a reason to heart and she wants to discover what that reason is. I loved Bridge's shyness and her tentativeness into finding a club to join at school and how she slowly discovers where she belongs and that she fits. Emily gets caught up in a texting-turned-sexting relationship and decides to send a photo to her crush which then gets sent around school. I loved how Miss Stead deftly handles this plotline. It's easy to see how Emily can get caught up and how she trusts those around her. It also discusses how society views girls and how girls are treated in situations like this and how often their treatment is unfair and their reputation is harmed while boys reputations are intact. It's a great commentary and something that is a must read and should be discussed with middle schoolers. There's also the unnamed narrator, who is struggling with trying to let a best friend go because the truth is there about who the friend really is, but it's hard to say goodbye. And can you stop being friends with someone and have a new best friend? And can secrets really hurt friends? Bridge's search for her identity and who she is, Sherm's broken relationship with his grandfather, Tabitha's struggle to grow up, and Emily's crush on an older boy. There is so much wonderful fodder here for great book discussions. And the writing is fantastic. Things are presented in a way that readers will understand, will relate to, and won't feel like an adult is talking down to them or doesn't understand. I think Goodbye Stranger could be a pick for a parent/child book discussion as well. Rebecca Stead has finally won me over with this one. I really loved it. I kept wanting to go back to it, wanted to keep reading, and I was interested in all the characters. Everyone was well developed and the plot wove together wonderfully. 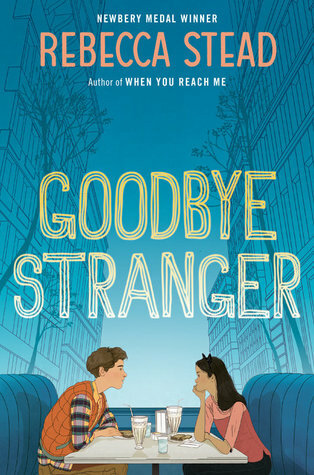 I think Goodbye Stranger is an absolute must read of 2015 and a book that older tweens and young teens-and their parents-should get their hands on and hopefully read together. About the Book: After her parents divorce and Zoe moves with her mom to upstate New York, the last thing she expected was to meet someone like Digby. No one really likes Digby when they first meet him-he's eccentric and annoying and only shows up when he wants something. Zoe just wants to survive her junior year with good grades and no problems so she can move back to NYC with her dad and attend a private school for her senior year. But Digby will change all of that. When you're with Digby, you can't help but get pulled into his madcap schemes and (sometimes illegal) hijinks. Digby's on a planet all his own and Zoe can't help but get pulled in as Digby tries to solve the mystery of a local missing girl and discover if it has any connection to the disappearance of his sister years before. GreenBeanTeenQueen Says: The book marketing this meets that for this book is perfect-imagine Veronica Mars mixed with a John Hughes movie with a touch of Sherlock. That pretty much sums up Trouble is a Friend of Mine perfectly. There's lots of razor sharp dialogue and wit, plenty of pop-culture references, an amateur teen detective who somehow continues outsmart everyone around him, and a mystery to be solved. All that wraps up into a pretty hilarious and totally fun package and you just know going in, from the very first page, that just like Zoe, you're going to end up on Planet Digby too. Tromly is a former screenwriter and that really comes across in her writing. The plot is very fast paced and the dialogue is snappy. It also reads like it could translate to the screen very easily (which I would love to see happen-this could be a great teen movie!) Zoe isn't the most well developed character. She's actually a bit bland, but I think part of that is purposeful for the novel as it allows the reader to jump right into Zoe's character and experience Digby for themselves. The rest of the supporting characters are funny, but a bit typical of teen novels-the cute popular boy, the mean rich girl, and the nerdy outcast. Yet all together, they do make for a pretty funny group and it works. Digby on the other hand is such an enigma that you can't help but want to know more about him and follow along on his crazy escapades to solve whatever mystery he's surrounded himself with. The main focus of the novel is mystery and friendship and while you could read it as a romance (very slightly) that's not a main focus at all, which I really liked. This is one of those books I can hand to readers looking for a mystery and I know they'll be engaged with a great mystery without having to wade through lots of additional subplots about love triangles or family drama or forensic or paranomal elements. There's also plenty of humor and with the contemporary setting, so I think even non-mystery readers would be willing to give this one a try. 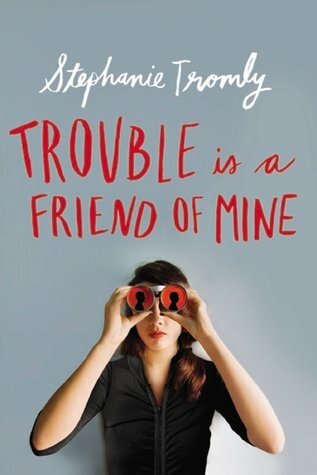 And with the John Hughes comparisons, I also think Trouble is a Friend of Mine has great crossover appeal! I had a ton of fun reading it and there were several points in the book where I was disappointed my lunch break was up and I had to stop reading because I just wanted to read one more page. The story especially picks up speed once the group goes to the school formal, and the mystery solving really takes off. Sure the situations the teens get themselves into can be far fetched, but that's part of the fun. The ending is left very open, so fingers crossed we get to hear more from Digby soon! One of the most interesting parts of being a librarian is that I get to spend a lot of time observing the public. Every day is spent interacting with lots of different families and throughout the summer, I've noticed a trend that makes me very upset. It's been happening for awhile, but I've noticed it with more and more frequency. Parents (and grandparents, aunts, uncles, siblings, babysitters-whoever!) do not look up from their phones and engage with their kids. The library is a wonderful place to come and engage and play with your children, but so many adults use the library as a break or a babysitter. They come in, let the kids loose in the department and instead of creating a family trip, they spend their time engaged in their phone or computer. Over and over and I see these kids looking for someone to read a book to them, to play with them, to watch their puppet show. 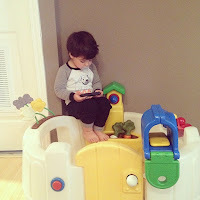 They wander around the children's department seeking out other kids to play with-sometimes with success, sometimes not. Kids come up to the desk and ask if we can be an audience for their puppet show and of course I try to say yes. Not just because I want to encourage these kids, but as a librarian, my job is to model early literacy skills and talking with kids about their puppet show is a great early literacy skill. But I can't always say yes-I have lots of patrons to help, programs to set up, questions to answer-contrary what people may think librarians do, we don't get to watch puppet shows and read books with kids all day. 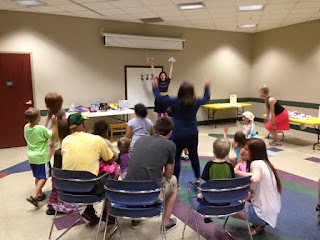 The absolute worst and the thing that bothers me the most is when I see this happen in storytime or at our large Summer Reading Program Performers. (We bring in performers like singers, magicians, comedians, jugglers, etc once a week during the Summer.) Instead of engaging with kids during storytime (especially during preschoool storytime-that's when it's the worst!) adults let the kids sit up front while they sit in the back and use storytime as a thirty minute break to socialize, check Facebook, text. I see the kids excitedly signing or dancing to a new song or correctly guessing the animal in the book we're reading and look back to see their adult's proud faces, only to have the adults not looking at them. During our big weekly Summer performers, I try not to put a lot of chairs out to encourage the adults to sit with their kids. But that doesn't stop grownups from finding a chair, unstacking a stack from the back and sitting in the back and using the performer as a babysitter. We recently hosted a Big Hero 6 Robot Build-Along and I was so excited to see that about half of the room took the opportunity to sit with their kids and create a robot out of boxes together. The other half sat off to the side and had social time with their phones and with friends instead of using it as a family program. I even overheard one parent say to her friend as she was walking in to the program "well, we'll see how it goes and if we can leave" to which I politely reminded her of the library's unattended children policy. Engage with your kids and they will model your reading behavior! 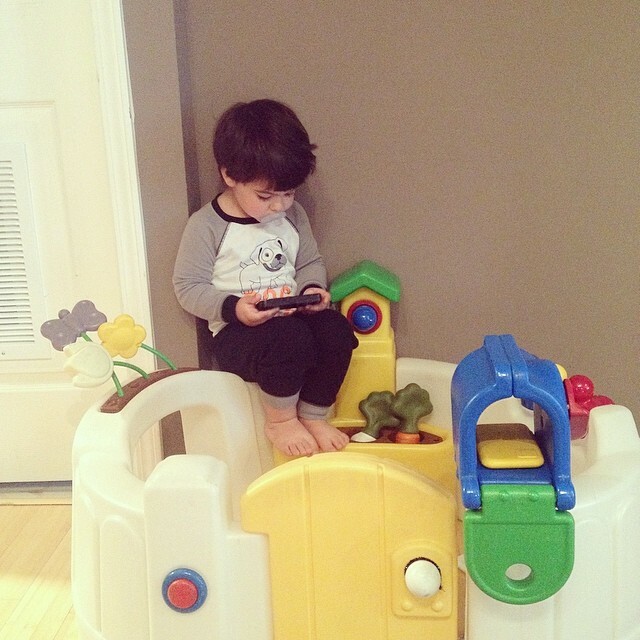 We're wasting prime opportunities with our kids when we become distracted and engaged by something else. 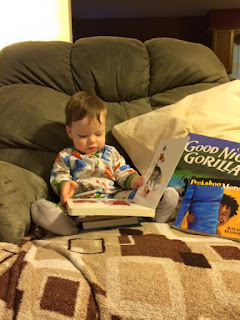 These programs and time spent at the library is hopefully growing a lifelong love of reading and the library and helping your child engage in early literacy skills which will help them become better readers and writers. My staff and I focus on early literacy skills in all of our storytimes, we work hard to create engaging programs for families, and the reason we have toys in our department is to encourage families and share ideas about how to incorporate the Roads to Reading (our early literacy program) at home. 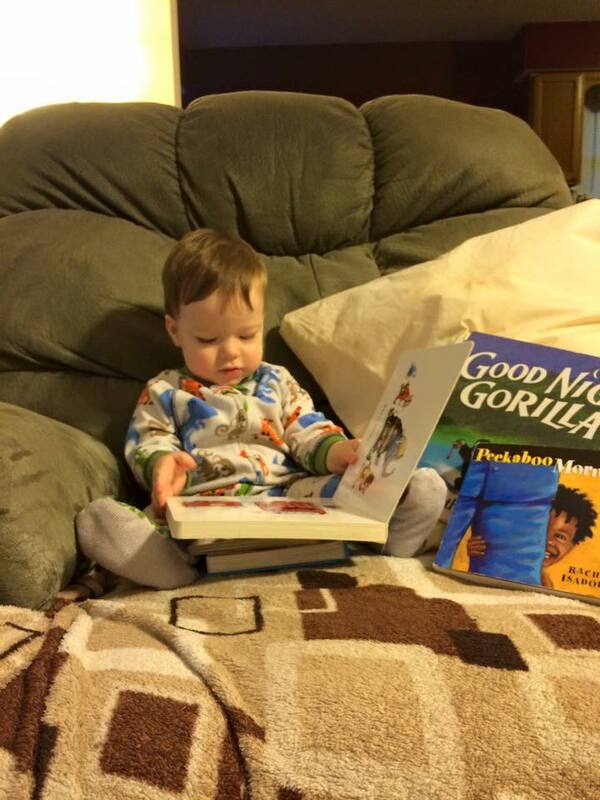 We want to share with families how they can Talk and Read, Sing and Rhyme, Play With Letters, Tell Stories, and Love Books anywhere and everywhere! But librarians can only do so much. Our hope is that we will help create readers, but that won't happen unless kids have that behavior modeled for them. And when adults are only engaged in screens instead of taking the time to engage with their kids, this opportunity is lost. I try to mention this at the beginning of programs-how engaging with your kids means they will get so much more out of the program-but that only goes so far. I can only say so much and try so hard to get the message across. I know it's tough. I know it's exhausting. I know you want a break. But the library is such a wonderful chance to connect and engage with kids. They are becoming involved in the community and learning about things that interest them. They are realizing the library has lots of wonderful things to offer. They walk into the library and are given their choice of all the materials there and they realize the world is open to them. This is a powerful thing. So please, look up! Engage with your kids. Talk to them. Explore with them. Play with them. Create with them. Experience the library together. I promise your visit will be much more rewarding! I'd love to know ways you encourage parents to engage with their kids at your library. Any good tips and suggestions? I've hosted two Fandom Starts Early Geeky Storytimes for kids and I knew it would be the perfect fit for LibraryCon. 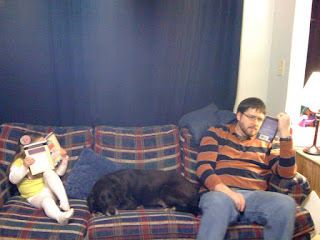 My previous Fandom storytimes have been OK, but I held them on Friday evenings, which are always a tough time to draw a crowd. Plus, I didn't get the true geeky families I was hoping for and I knew my audience at LibraryCon would appreciate and love a storytime based on fandoms. I took some things that I've used before and added a few new things for the LibraryCon version. I actually had to adapt and change my plan at the last minute because my crowd ended up being much younger than I anticipated. So here's what we did for Fandom Starts Early LibraryCon! Opening Song: Hedwig's Theme-I opened the doors had the kids walk in to Hedwig's Theme and welcomed everyone to Fandom Starts Early Storytime. I told the parents that it's fun to introduce their favorite fandoms to their kids and we have lots of great books to help do so. Plus, being a geek is awesome! 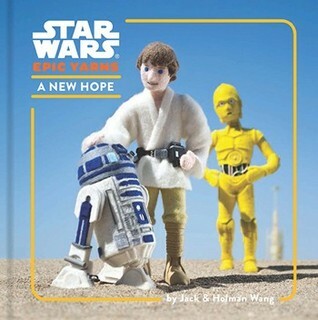 Book: Star Wars Epic Yarns: A New Hope-The epic yarns books are simple and perfect for geeky storytimes-plus it worked well with my young crowd. Song: The Freeze by Greg and Steve-I used a picture of Dr. Horrible and his freeze ray and every time he appeared, we had to freeze. You could also use Mr. Freeze for this. Here comes a villain. Stop that guy! This superhero can save the day. Off he/she flies-up, up, and away! 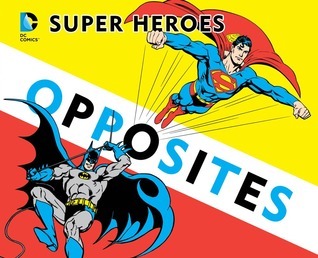 I used the awesome superhero kids that Hafuboti made and put magnets on them to use as a magnet board rhyme. I had lots of activities set up around the room for the kids to do. -Paint a Dalek-I printed off black and white pictures of a Dalek and let the kids use dot stampers to color the Dalek. Make sure to have wipes on hand! 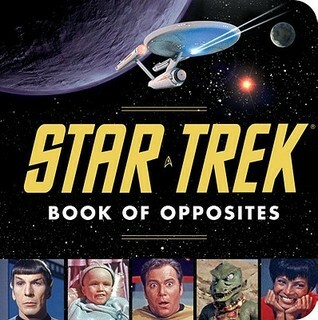 -Match the Star Trek colors-I put up pictures of the Next Generation cast and sorted them by uniform colors (Red, Yellow, and Blue) and put out blocks to sort under each picture. -Design your own house crest. I printed off a blank house crest template and let the kids create their own. -Make your own Origami Yoda-I used the simple Origami Yoda pattern with green paper for the kids. -Decorate the Death Star-my amazing teen librarian, Valerie painted over a globe with chalk paint and we now have a death star that can be drawn on with chalk. It's tons of fun and reusable! I also had lots of comic books to give away to the kids and a big book display for various geeky books. This was the most successful Fandom Starts Early Storytime because my crowd really appreciated the topic and thought it was lots of fun to get their kids talking about their fandoms. The kids really loved the superhero masks and the parents loved the matching game. I can't wait to do it again next year! And I'm always looking for geeky storytime books so if you have any ideas, I'd love to hear them!